This might be overdoing it. In a song called “Born Under a Bad Sign”, blues singer Albert King wailed, “If it weren’t for bad luck, I wouldn’t have no luck at all.” Sometimes the news feels that way, too, doesn’t it? It all seems to be bad. That’s why I recently flung my hat into the air and yelled “hurrah!” when I heard some great news for a change: Chocolate might be good for us! Over the years, a number of studies have been conducted on its possible health benefits. People in lab coats have presumably been administering hot fudge sundaes and milk shakes, taking notes all the while. A group of British researchers has since analyzed the data from seven such studies that had a total of 114,009 participants. Here’s what they found, as reported in BMJ, the online British Medical Journal… “Highest levels of chocolate consumption were associated with a 37% reduction in cardiovascular disease and a 29% reduction in stroke compared with the lowest levels.” If I’m reading that correctly, that means eating chocolate could help reduce the risk of heart disease or strokes. Wow, I thought, maybe I should step up my chocolate intake to, oh, maybe one Snicker bar every four hours. Or possibly I should have a piece of devil’s food cake once in a while instead of a salad. Of course, just when the news seemed to be so good, spoilsport dietitians started responding to the study results with their usual warnings. They pointed out that our favorite chocolate treats are also full of sugar and fat, which potentially increase the risk of heart disease. Even one of the people who conducted the chocolate study used the dreaded M word — moderation. Did you catch the good part? “Further experimental studies are required”. OK, I’m volunteering right now to be a chocolate guinea pig in the next study. My only stipulation is that I don’t want to be part of the group that gets the placebo chocolate — I want the real thing. I’m willing to advance the cause of science by submitting to profiteroles, to mint chocolate chip ice cream, to Girl Scout cookies, to chocolate mousse. If need be, I’ll even report to the Ben & Jerry’s factory in Vermont. This is important work, people — who’s with me? This entry was posted in Dining, Science and tagged chocolate, heart health. Bookmark the permalink. I see all these places you have visited, so I know Switzerland is in the mix somewhere. That brings us to your subject today: chocolate. Is it really better in Switzerland? I haven’t spent a lot of time in Switzerland yet, so I need to go back and give its chocolate a more extensive taste test. That’s a good question, though; what country or region makes the best chocolate? For some reason, Scotland came to mind… the Netherlands… Italy… Colorado might have a claim… Hm. About the only place that I’d rule out is China… What are your thoughts? Don’t forget that delicious hot chocolate with chilis from the Mayans! Are you thinking of mole poblano, Jordan? It’s a sauce that has several ingredients, including chocolate and chilis. The chocolate seems to sort of calm down the “scorch” in the peppers, doesn’t it? And fortunately, we are in chocolate season right now – big bags of the dark-or-milky gold are available at bargain prices all over town. It had never occurred to me that chocolate was a seasonal crop, but your comment prompted me to look it up. According to Encyclopedia Britannica, cacao trees have peak yields from October to February (as you said), and again from May to August. Thanks for your note! I saw a license-plate frame the other day with the message: “Just hand over the chocolate and nobody will get hurt.” And count me in as a test patient. Let’s hope we get orders to report to a Baskin-Robbins soon. You’re right, Bill — photo piracy is a big issue on the internet. Several of mine have been hijacked by other websites. 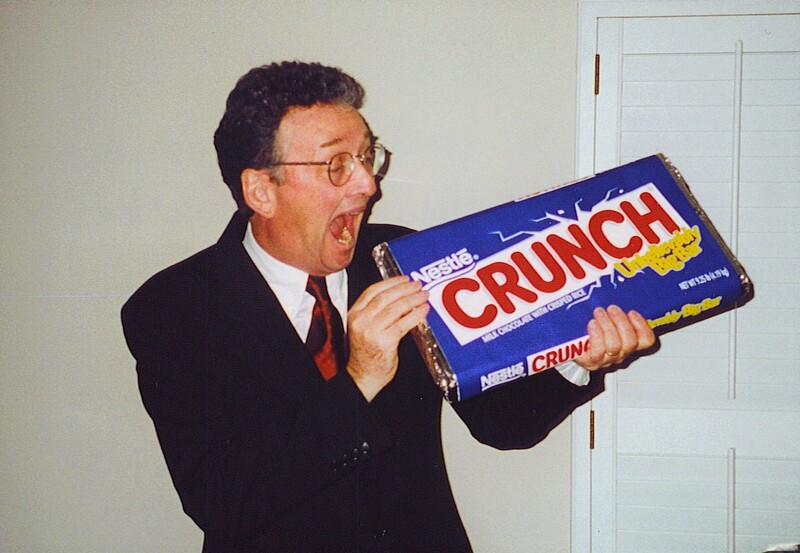 In the instance of this giant candy bar, though, it was presented to me by an official of the company (probably not as high-ranking as Michael), so I thought permission was implied. Incidentally, by the time I finished that chocolate bar, the suit no longer fit me.